The Aprilia Futura comes with a 16 tooth Afam sprocket as standard, but smaller and larger sprockets are available. The rear sprocket has 43 teeth. Going down to a 15 tooth sprocket is a popular modification done to give the bike more acceleration at the cost of about 5 mph on top end. The standard length 108 link chain can be retained. A Futura with a 15 tooth sprocket pulls noticeably harder and feel much more willing. 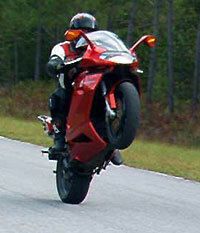 Be prepared for more unintentional wheelies on the throttle and being able to give a few sports bike riders a fright. Owners who have done this report little change if any in fuel consumption and the only downside is having to brake more when riding downhill. Having made the switch myself I wouldn’t go back to a 16 tooth front. The bike will top out at 145mph but accelerate much harder, making it one of the cheapest and most effective ‘go faster’ mods you can do. But some riders swear by it and others prefer standard gearing. Others again have gone up a tooth to a 17 tooth sprocket. It’s a personal thing, but at least an option open if you fancy a change.